Enthusiastic new students. Move-in chaos. Hype, excitement and school spirit. Expect all this, and more, as students flock to the University of Oregon campus for the new school year. And kicking it all off: Week of Welcome, an event also known as WOW. The week has become a tradition at the UO. It’s a time for new students to get settled, to begin building relationships and to connect with campus resources before the start of the term. This year WOW will be led by a new welcome team: undergraduate students who work in orientation programs and are dedicated specifically to new students’ transition to college. Most students will begin moving into the residence halls Thursday, Sept. 20. Students living on campus will find their move-in time and room assignments emailed to their UO webmail address. Maps and more information can be found on the housing website. Traffic on and around campus will be heavy during this time, due to move-in combined with ongoing construction. 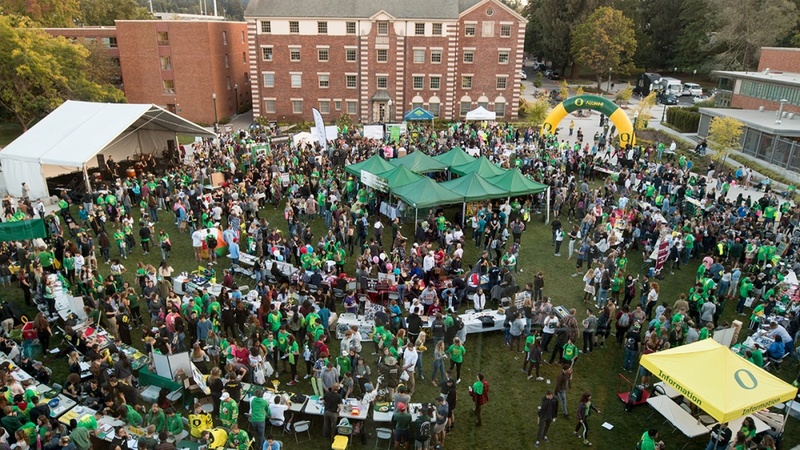 After move-in, the UO will continue some of the most cherished WOW traditions, including the Kickoff, the Flock Party, Duck N2 the Rec, convocation and the class photo. This year’s WOW Kickoff on Sept. 20 will immediately precede the Ducks’ volleyball game against Oregon State University. The entire incoming class will pack the Matthew Knight Arena to cheer on the Ducks in this Pac-12, network-televised match. On Friday, Sept. 21, new students will be officially welcomed to the UO at convocation. The culminating event of WOW will be the traditional class photo Sunday, Sept. 23. The Class of 2022 will have its taken in Autzen Stadium.